Whether it’s time for a bigger place or you’re new to the area and searching for apartments for rent in Laramie, the team at Laramie Property Management Group is here to help! Take a list at our current vacancies to find a space that is perfect for you. Once you’ve found the perfect place to call home you’ll have the task of getting everything set up. It can be a challenge to make a new living space feel just right but with a little bit of effort it will feel comfortable and cozy before you know it, and fortunately our team is here to offer a bit of advice in today’s post! 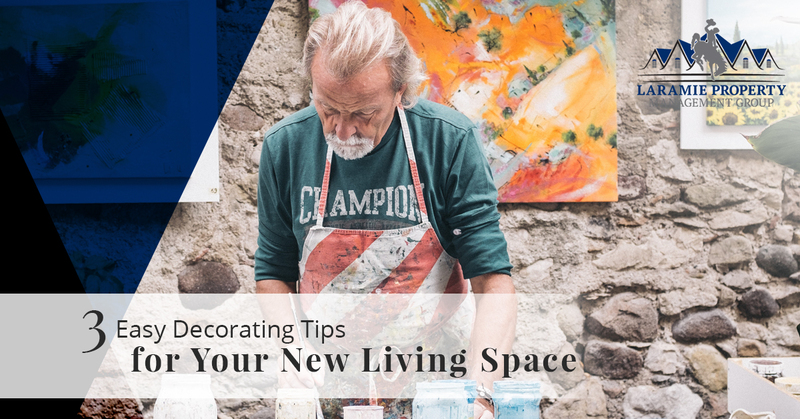 Keep reading to get a few decorating tips for your new living space. Want Your Space to Feel Cozier? One of the easiest design tricks in the book is to cozy up your home with a few plants. Whether or not that means a trip to the grocery store every week to pick up fresh flowers is entirely up to you. Our suggestion is to grab a few succulents from the home improvement store. They are inexpensive and with some carefully chosen pots or vases they can make a massive difference without breaking the bank. The added benefit is that they require very little water to thrive so you don’t have to remember to water them! All too often people think that they have to hang art on their walls because it’s in style. Others will simply head to the nearest big box store and grab whatever catches their eye. Although there’s nothing wrong with either of these approaches, we’d like to advocate for putting a more personal touch on your home’s decor. It can be as simple as looking up easy art tutorials online and following the directions or as extravagant as tracking down a local artist that you appreciate and commissioning a custom piece. Last but not least, finding the ideal placement for your furniture can make all the difference in the world. Even if you’re the type of person who has mentally figured out where everything is going to go before you even move in our recommendation is to take some time and experiment a bit. The idea of lugging the couch to the other side of the room might not sound particularly appealing, but take it from us that sometimes just seeing a piece in a different spot in the room will unlock a number of new possibilities that make your space feel cozier. Are You Looking for Apartments for Rent in Laramie? Finding apartments or houses for rent can feel like a big challenge, but at Laramie Property Management Group our goal is to get people into the right living space that meets their needs. Laramie is an amazing place to live and we’d love the honor of lending a helping hand. Contact us today if you have any questions. We look forward to hearing from you!